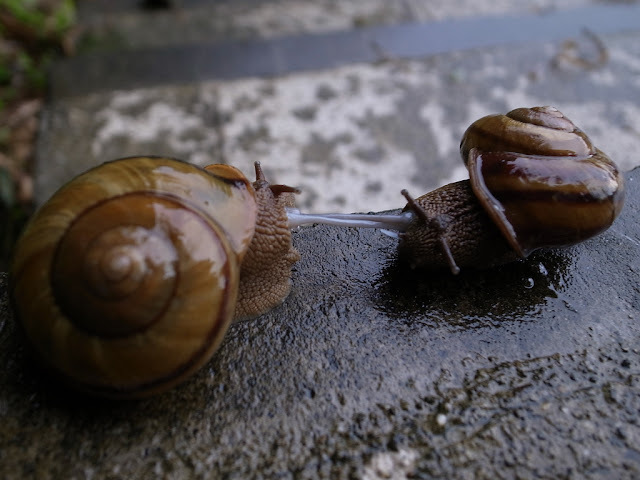 When you get over the picture above – yes, they really are doing what you suspect they are doing (and it's not a tug-of-war) – ask yourself how much you really know about snails. If your answer does not preclude curiosity to discover more, then head over to our sibling site, the Ark in Space, which has a multitude of interesting facts about snails, a creature we mostly dismiss as a garden pest. 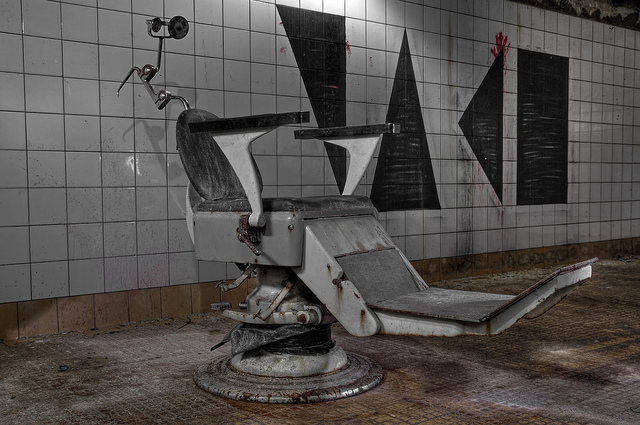 And yes, before you ask, there are photographs which might make you squirm a little. North Wales (or Gogledd Cymru as it is locally known) is well known in the UK as a place of outstanding natural beauty but the rest of the world seems to only be half aware that this little piece of very wet paradise exists. Well, obviously, we have got to help put that right! 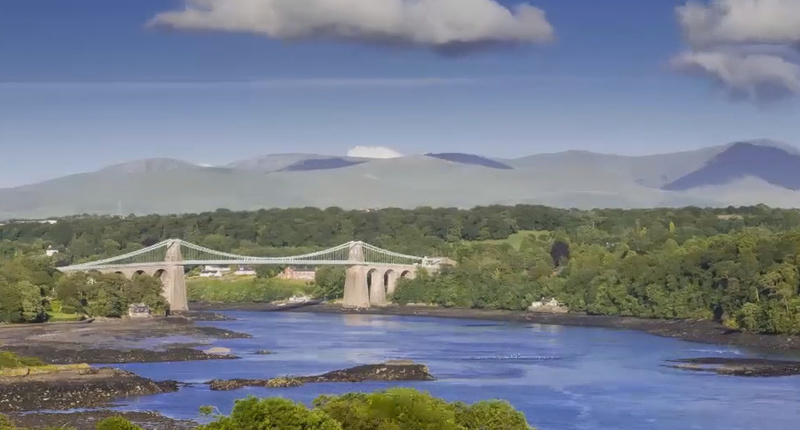 Howard Litherland has created this wonderful homage to North Wales which showcases the spectacular beauty of this wonderful land. 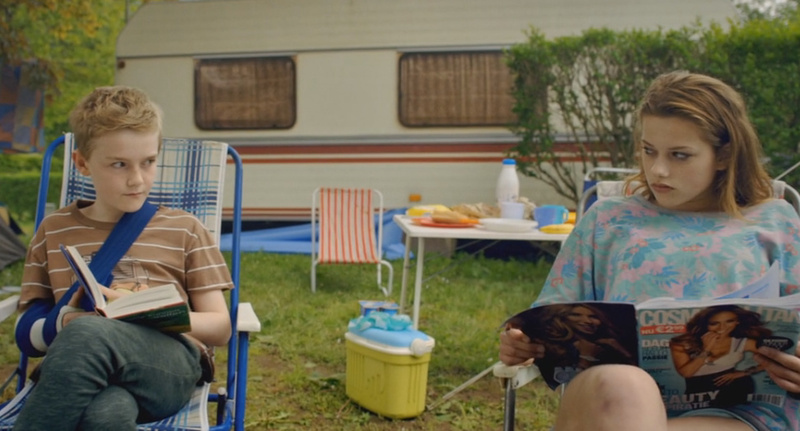 A Dutch family are just about to go on their annual camping holiday when Pelle, their twelve year old son, breaks his arm. His older sister tires of him easily and urges him to make his own friends but his shyness does not allow him to do this. Yet when romance seems, somehow, to beckon, will Pelle realise that the world won’t wait? Featuring a lovely central performance by Rohan Timmermans, Plaster was made by independent film company New Amsterdam. It is sometimes the simple ideas that are the most effective. Here, Studio Smack has created something quite extraordinary for Greenpeace’s online magazine. It involves hacking a treasured Disney favorite of mine. The title sequence is as it always was but for one major differences. Before our eyes we see them disappear from the screen. As such it’s as powerful a message about what we are doing to the environment as I have ever seen. Bravo. Here are a few photos taken by photographer Sergi Albir in Valencia. The Doctor Who crew arrived in Spain’s third largest city on 26th July to film scenes of the second episode of the forthcoming Series 10. Life is a cycle, one of birth, struggle, reproduction (possibly.. 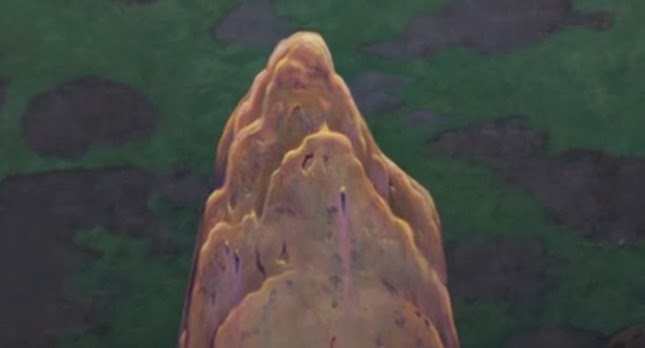 hopefully?) and then, inevitably, death. It’s been presented to the world in many ways through the ages via the arts and this is another fine example to add to that collection. 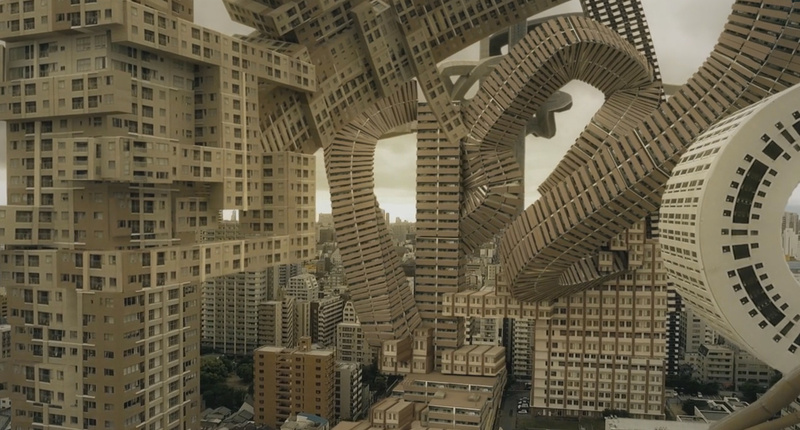 Visual art director Kouhei Nakama has created this visually stunning piece. The music is Shining Dawn by Kai Engel. It is entrancing. 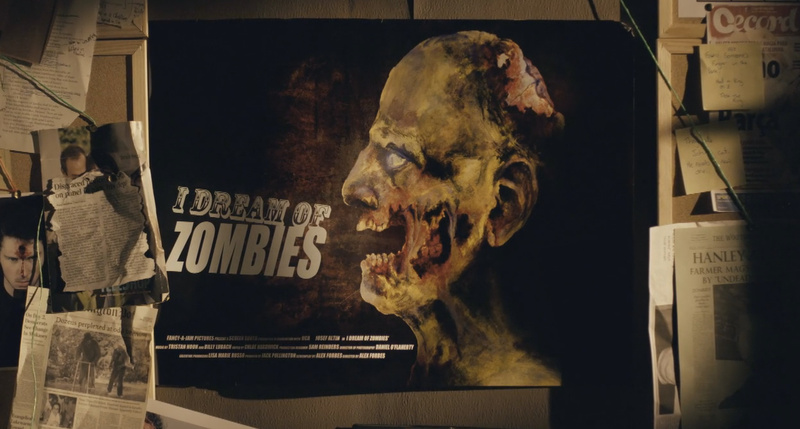 A young man believes that the zombie apocalypse is inevitable and spends his time training in anticipation of the day. The problem is, he isn’t very good with the various weaponry. However, one day his true weapon of choice arrives which is just as well as it coincides with the event he has been waiting for all this time. Written and directed by Jack Forbes and starring Joesf Altin, this was made for Random Acts, a short-form strand on the UK’s Channel 4. 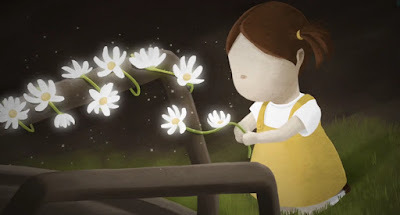 A little girl named Buttercup Bree falls victim to a gang of shadowy bullies... until she discovers that her love of daisy chains unlocks a power that will bring life to the darkness of the playground. This animated film, voiced by Oscar-winning actress Kate Winslet takes us into a Tim Burton-like world. It was produced by Protein One, and written and directed by Calvin Scott Davis. Some things appear where you least expect them. 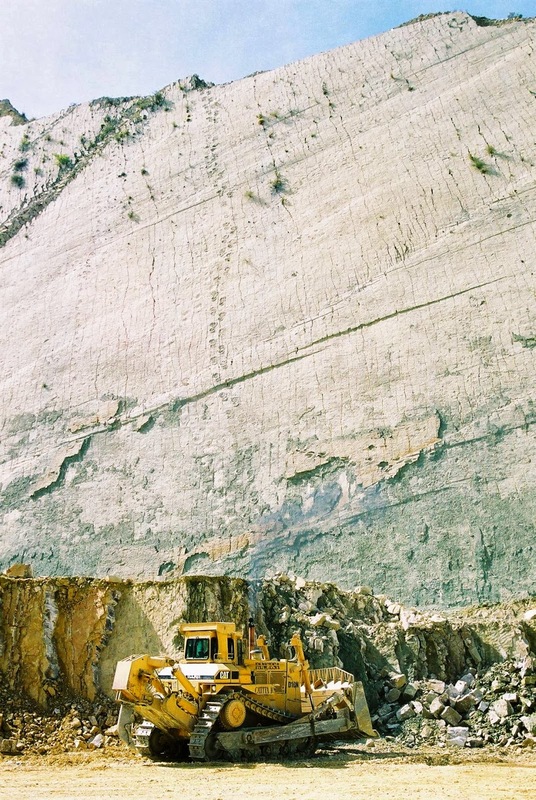 Although dinosaur tracks have been discovered the world over, climbing up a near vertical wall in a Bolivian quarry? Bolivia – yes, fine. Zooming up hundreds of feet towards the skies? Hardly. Yet here they are. Spread across a limestone slab a mile long and almost 300 feet high, this great wall at Cal Orcko near the city of Suvre reveals more than 5,000 footsteps, with 462 discrete trails. Often the first step is the hardest. Yet those who choose to follow their dreams discover that this can liberate the same urge in others. 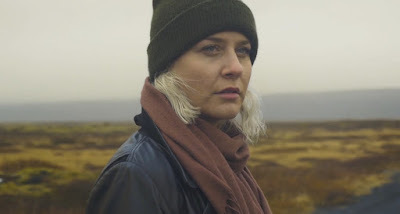 This short meditation, written and directed by Josh Brine and featuring the somewhat beatific presence of Fairlight Fitzgerald is, I think, intended as much for those who ultimately confront their fears and insecurities as it is an elegy for the author’s own choices. 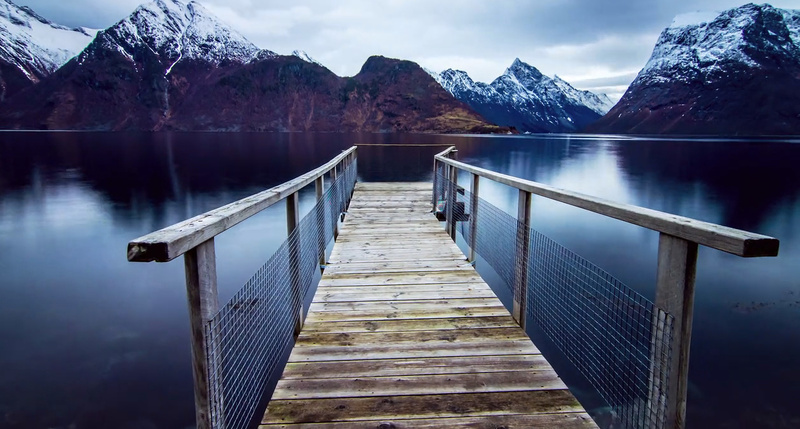 The Faroe islands serves as a perfect chosen location for this piece. 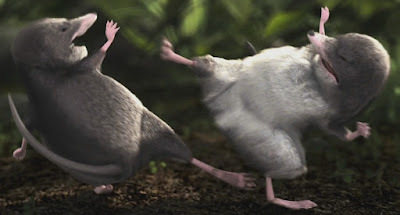 I had to debate for a second or two where to place these – on Kuriositas or our natural world sibling site the Ark in Space. As these are (extremely) tongue in cheek looks at what goes on under our noses then ultimately this was the place they landed. The first deals with the water vole, whose unassuming appearance belies its truly bellicose nature. The second concerns the common chameleon which simply cannot get enough to eat. Great fun! 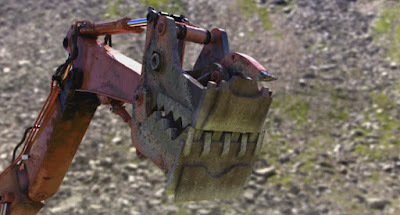 For months of the year they lie beneath deep snow, trapping it so that avalanches can be circumvented. But when the snow melts, what is beneath is exposed to the world. 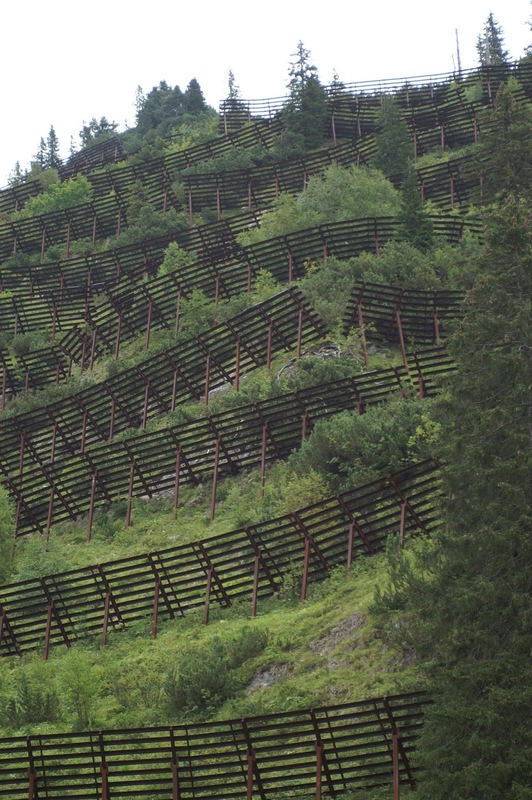 In the summer months many visitors scratch their heads at the sight of avalanche fences and wonder what form of sheep or goat they might be designed to contain. 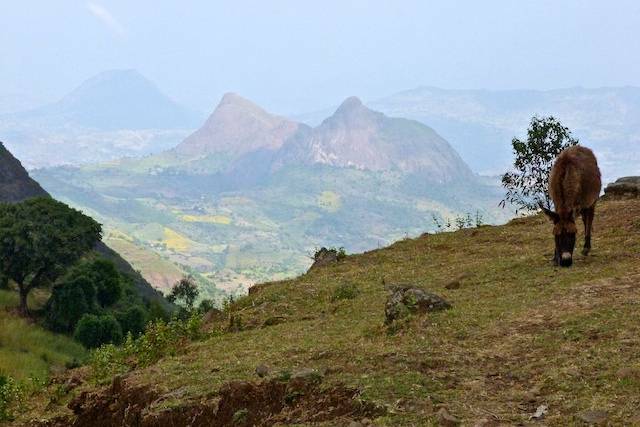 Their real purpose is often lost to the casual observer: to help keep roads, railways and towns – not to mention the people therein - safe from a sudden, often deadly avalanche. 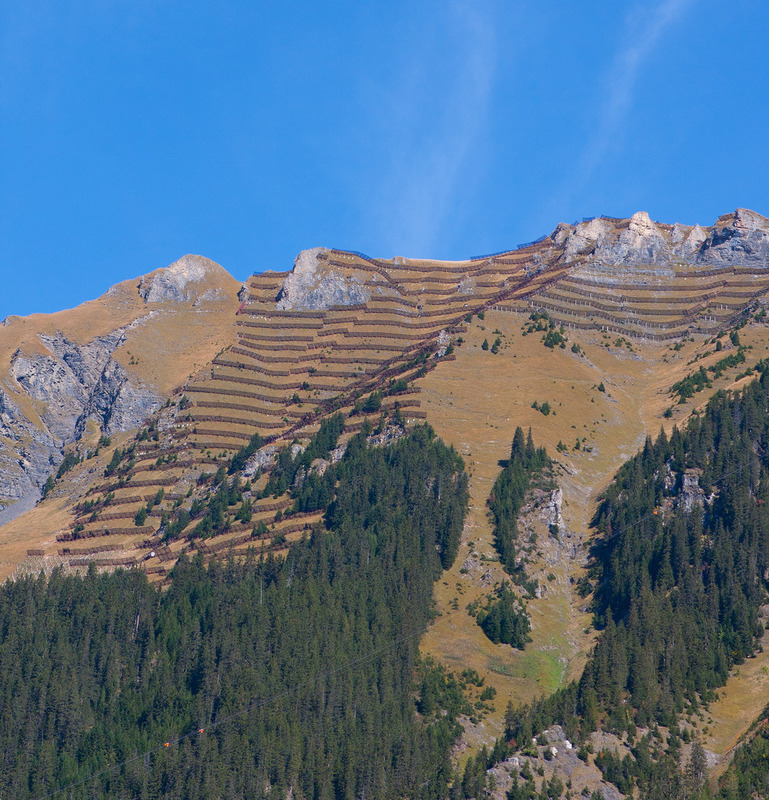 In places like the Swiss and French Alps, where locals have had to live alongside the threat of avalanches for thousands of years, intricate systems of artificial structures have mitigated the risk of avalanches for almost as long. 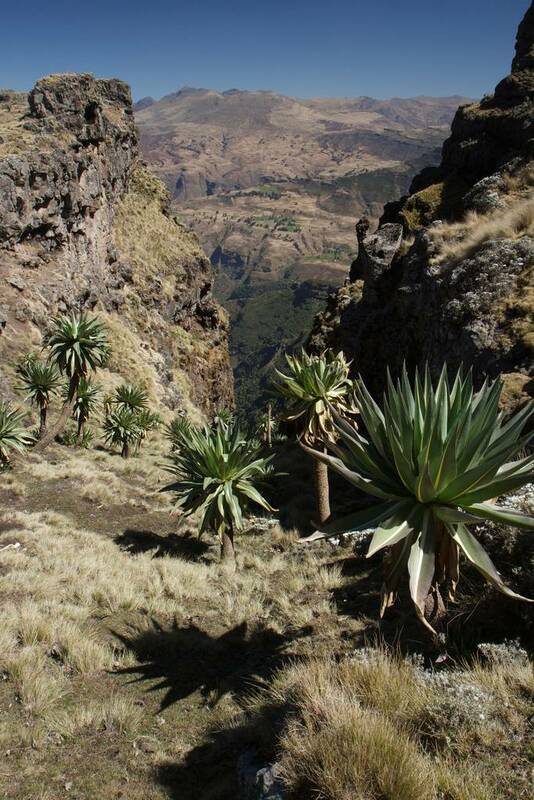 The Highlands are enormous and are divided by the Ethiopian Rift. All of the pictures you will see here are from the northwestern side of the highlands. 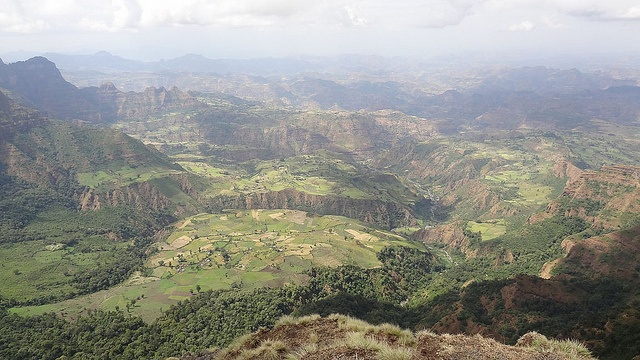 Designated a National Park in 1969 (the first of ten in the country), this portion contains Simien Mountain and Ras Dashan which is the highest peak in Ethiopia. 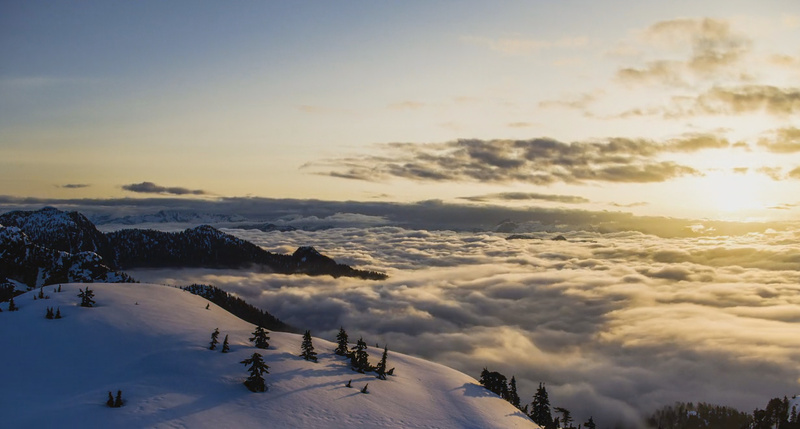 The day Nathan Starzynski first set foot on Mount Seymour, he knew it would have a lasting profound impact on him. Located on Vancouver's North Shore, the mountain looks down over the vibrant and pulsing city to the South, while the Coast Mountains stretch endlessly to the North. For 3 years, Starzynski returned on and off to seek inspiration, and to shoot as much time-lapse as possible. This is the result and it’s spectacular. 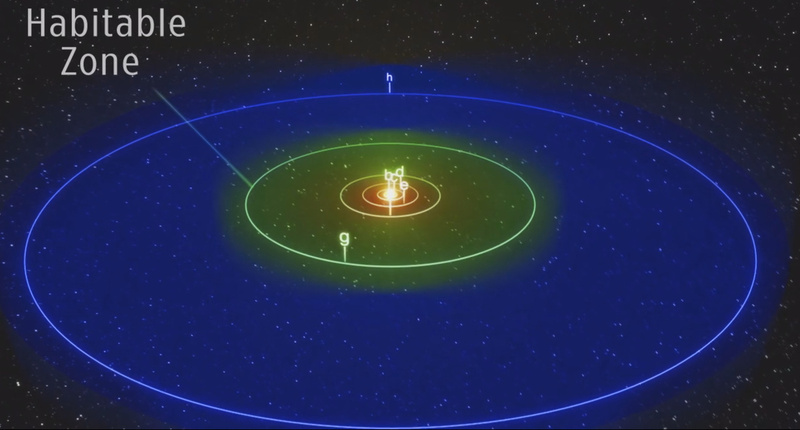 The Holy Grail that astronomers are looking for is an earth-like planet. Our nearest neighbour is Alpha Centauri and this documentary focuses on a group of scientists whose ambition it is to build a telescope which could detect a planet within the habitable zone of this star system. 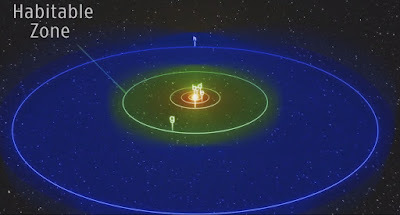 This is sometimes known as the Goldilocks Zone but even if a planet is in this area it may not support life. These guys want to know for sure! You want cute? You got cute. 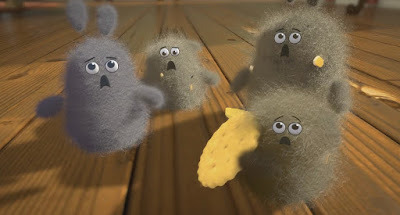 Fuzz and Lint live under the couch but they can’t resist the odd crumb that the messy humans leave behind. Their friends love a snack too but one day they tuck in just as the cleaner arrives and they find their very existence threatened. This very entertaining animated short was created by the team of Beth Tomashek and Sam Wade who created it during their time at the Ringling College of Art and Design. For the Edexcel Functional Skills Level 1 Reading exam you have to show that you can recognise ways that information is presented in a text. This can be straightforward… if you know what to look for… This video aims to show you how to pick up the two marks available for this question in the Edexcel Functional Skills Level 1 Reading exam. So, if you want to know how to pass your Functional Skills Reading exam, this is a good place to start. This is the SKILLS STANDARD you are responding to in this question. 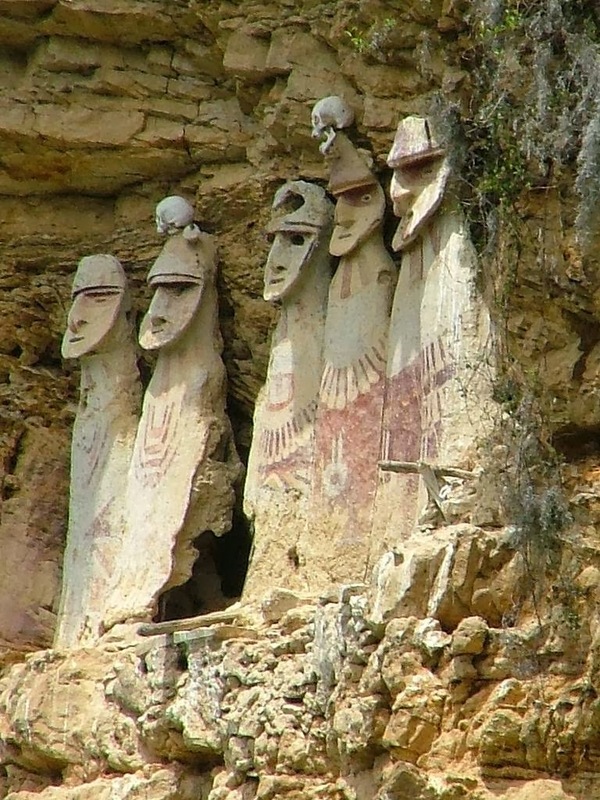 "Identify the main points and ideas and how they are presented in a variety of texts (L1.2.1)"
By the time the Spanish arrived in Peru at the beginning of the 16th Century the Chachapoya people had already been subsumed in to the great Inca Empire. 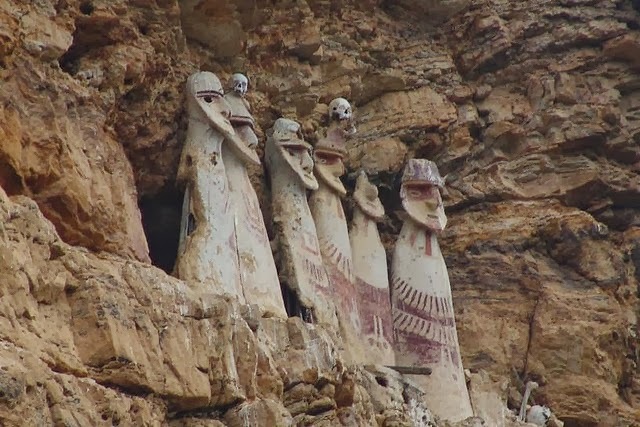 Although they had resisted the Incas fiercely, the lands of these Warriors of the Clouds as they were known had been annexed and had been forced to adopt the customs and culture of their conquerors. Yet they left one thing behind – the strange sarcophagi in which they would bury their dead. Take a look at the photograph above. Is it some strange kind of blooming plant? Is it a fungal growth attached to a tree? It is something else entirely. 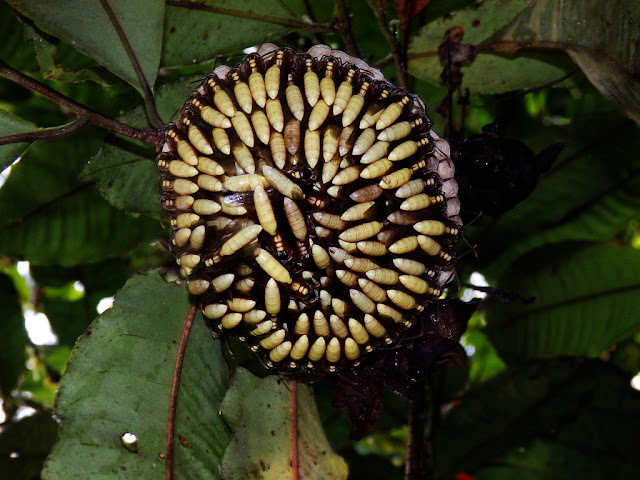 This is the bizarre nest of the Central American Paper Wasp. It is notable for one thing – an apparent lack of nest altogether. Those pale yellow cigar-shaped objects? They are the wasps, huddle together in neat order, waiting for the evening to come. Our sibling site, the Ark in Space, has the story with lots of fascinating photographs. If you liked the film Avatar and day-dreamed about visiting Pandora (yes, me too) then perhaps you can, after all. OK, not quite but Wulingyuan in south-central China is the closest that you are probably going to get. 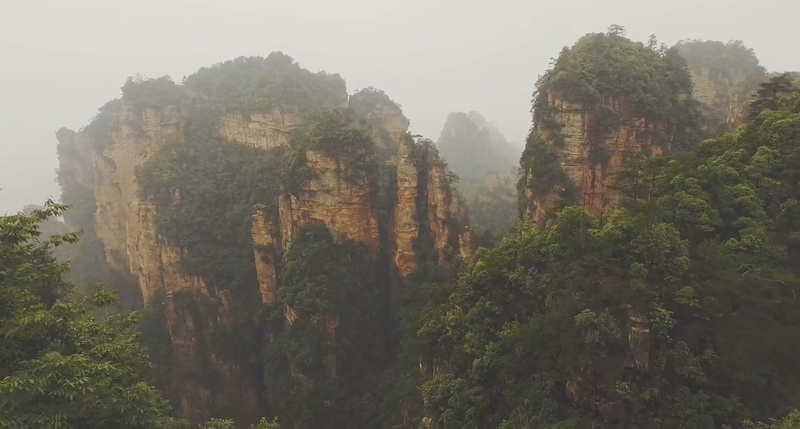 Filmed by Abel Blanco with his Phantom3P, this perfectly showcases the exquisite landscapes of the region. Shot over five days Blanco managed to avoid both the incessant rain while he was there and the tourists (don’t go here if you think you will be alone!). Slugs and snails and puppy dog’s tails? Well, just slugs in this case – and one species in particular. This is the Banana Slug, featured today on the Ark in Space. It is the second largest slug in the world and found on the western seaboard of North America. It gets its name for obvious reasons (even though the ones in this picture are not nearly as yellow as they can get). You may think that slugs in general are no good garden invaders, born only to wreak havoc on your carefully cultivated plants. 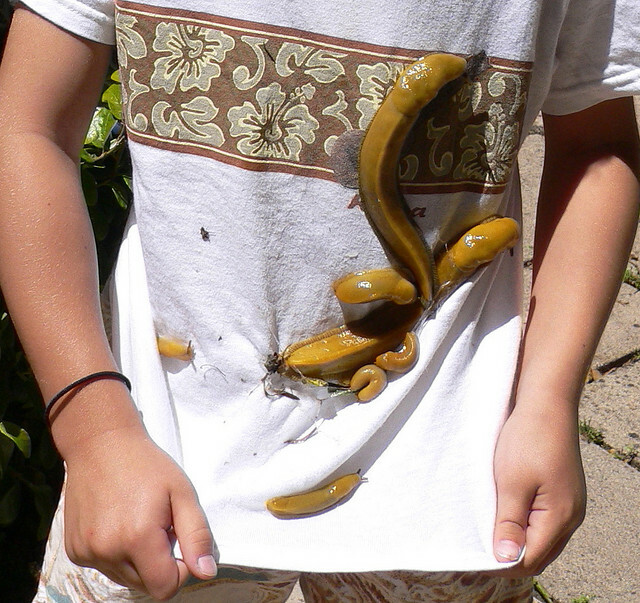 Yet the banana slug is a detritivore and is interested only in dead foliage. In fact it contributes to its ecosystem massively. Read more about this fascinating slug over at the Ark in Space. Scottish Ballet dancers Madeline Squire and Javier Andreu discover each other as they explore a labyrinthine derelict Glaswegian swimming pool. As such it combines two of Kuriositas’ favourite things – dance and abandoned urban spaces – so it doesn’t get much better than this. A high-energy piece choreographed by Sophie Laplane, with music by British-born, Boston-based electro musician John Xela. 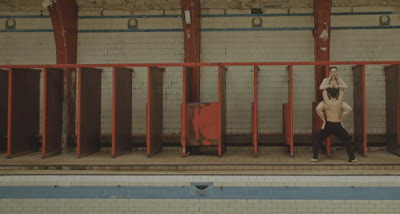 Maze was directed, filmed and edited by Eve McConnachie. 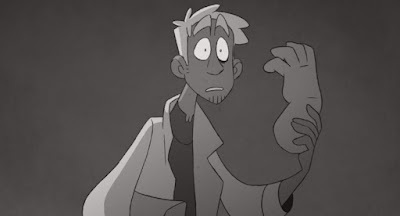 When a gravedigger (more of a millennial hipster than what you would ordinarily imagine if you grew up watching Hammer Horror movies as I did) discovers parts missing from the disinterred remains of those he had only recently buried, he decides to get to the bottom of it. He gets, perhaps, more than he bargained for. Graveyard Shift is the fourth year thesis by Carlos Schvepper (well done, by the way, for making a truly cheesy punchline work!). What does the American Dream mean for black Americans. 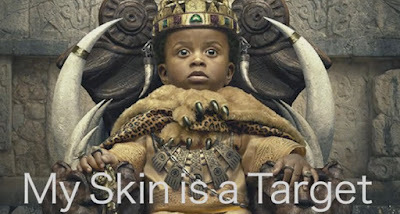 Written by DA Franklin of R World Productions, My Skin is a Target was written to shed light on this subject, especially when, as Franklin says, black people are often told how to feel, demoting personal experience to something that is less valid than an interpretation of those feelings by others. DA Franklin sheds a glimmer of light as one black male’s interpretation of the American Dream. In the last years of the nineteenth century the population of Berlin was expanding rapidly. The attendant issues of housing large numbers of people in cramped conditions were not far behind. 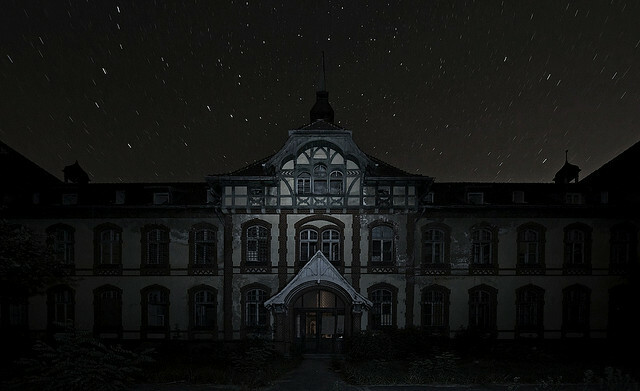 By 1898 the German National Insurance Institute had a sanatorium built for the victims of tuberculosis. 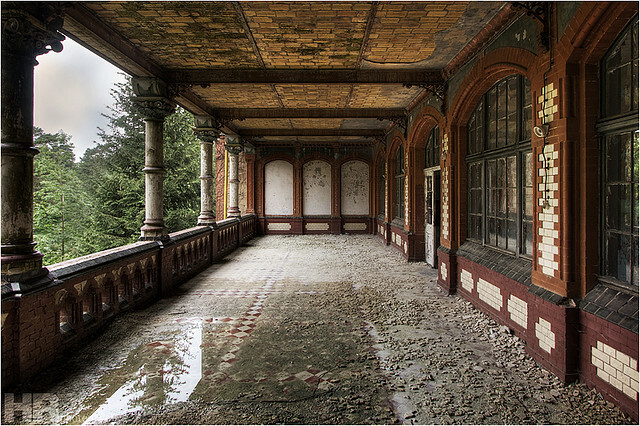 Beelitz-Heilstätten (or the Beelitz Sanitorium) steadily grew and functioned for many decades, playing host to a number of infamous patients, including Adolf Hitler. Yet most of it is now abandoned. Although just a short distance from the German capital, the Beelitzer forest was considered suitable for a sanatorium as the area enjoyed fresh air and countryside. However when the First World War broke out in 1914 it was not long before it was requisitioned and converted to care for the massive casualties inflicted at the front. In the later months of 1916 a young soldier called Adolf Hitler was sent there to recuperate from a thigh injury acquired during the Battle of the Somme. When you have to catch your own food the last thing you want is to be interrupted when you try to eat it. 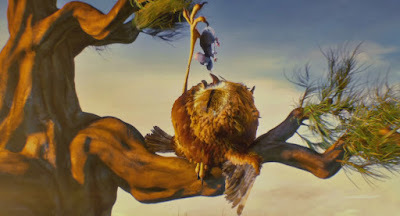 However, for this hapless owl, the opportunity to enjoy his meal without disturbance just doesn’t seem to happen – much to the amusement of his quarry. This entertaining animated short was created by Meike Mueller and his team at Filmakademie Baden-Württemberg. This was her second year project – we look forward to seeing what she comes up with for her graduation piece! Spatial Bodies depicts the urban landscape and architectural bodies as an autonomous living and self-replicating organism. Domesticated and cultivated only by its own nature. 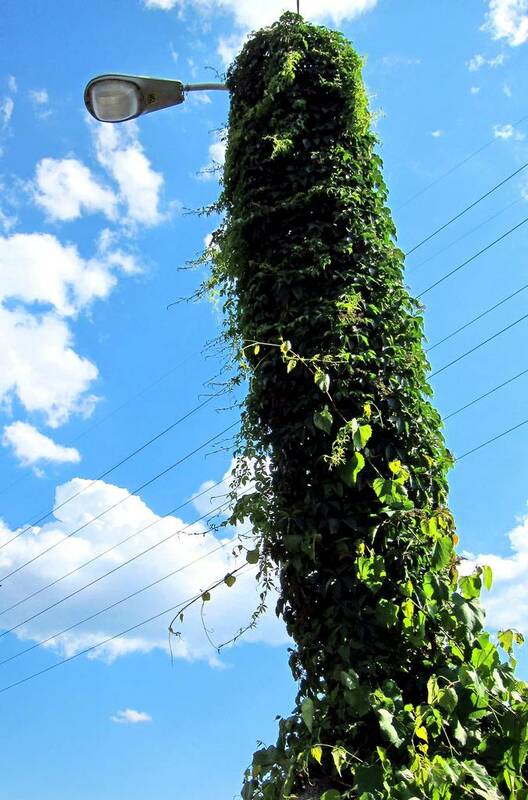 A vast concrete vegetation, oscillating between order and chaos. 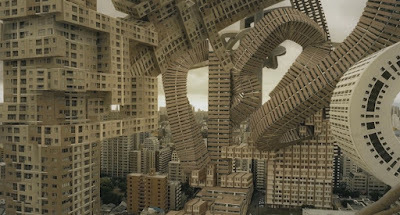 Filmed in Osaka, Japan, Spatial Bodies was created by AUJIK. There are people in this world who come up with an idea and get told that they are, quite likely, a little bonkers: that would just be the reaction of friends and family. The rest of the world would likely consider them stark-staring mad. Perhaps it was like that when Mike Oblinski came up with the idea of making a time-lapse of a tornado. I can just imagine the eyes rolling and the heads shaking. 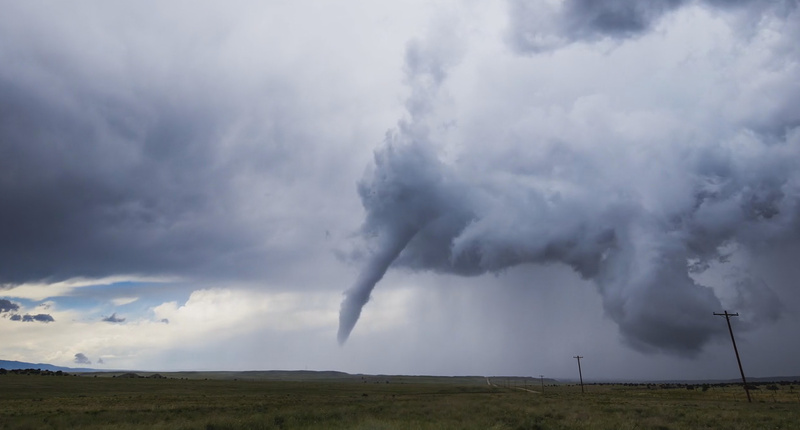 However, it didn’t stop him and this spell-binding footage was caught in Texas, Colorado and Oklahoma. I guarantee that once you start watching this you continue to the end. So, Oblinski might still be considered crazy but after this, possibly on the genius side of the tracks – always the right side to be on. Plus he didn’t only get one tornado – he got six. Tergo exists only to work. 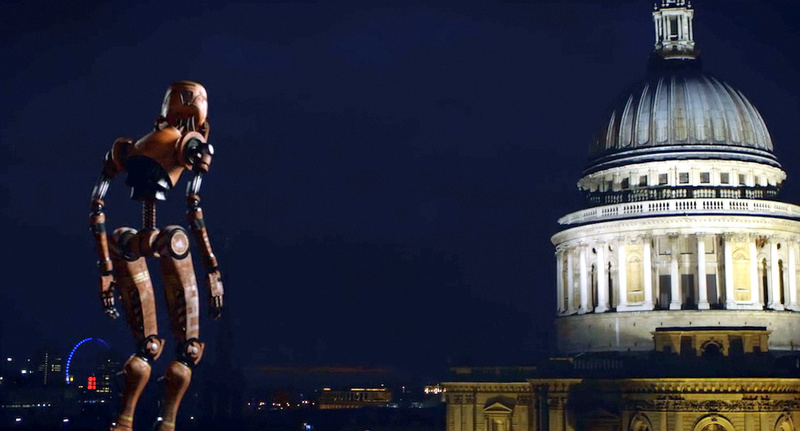 This robot cleans up the streets of London and has obviously seen better days. Yet a moment of self-awareness precipitates a change; the lost robot finds itself. 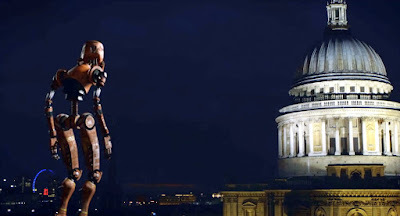 Tergo is a labour of love and devotion by director and Pallas Pictures founder Charles Willcocks. It is a modern day fable for anybody who might be lonely and caught up in the rat-race of life. 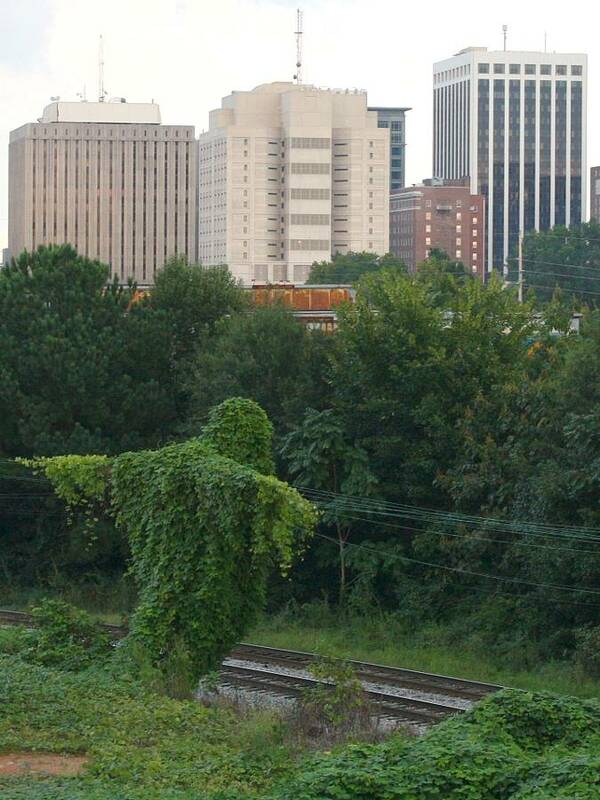 The history of the Kudzu plant in the United States is almost as bizarre as the sight of the places it overwhelms with its foliage. It is as convoluted and unexpected as something out of a Kurt Vonnegut novel. It is the story of a chance but inexorable slow burn alien invasion which the author may well have relished. Ever heard of Petramosaurus Cavator? This amazing species from the Alps is the subject of this award-winning documentary. Follow the entire life-cycle of the species, from birth, to mating to inevitable demise. Yet what is the future of this captivating and noble creature when it comes in to contact with man? That is the subject of this wonderful short by Francesco Aber and Alessandro Mattei who created it as their graduation film from the National School of Cinema in Italy. 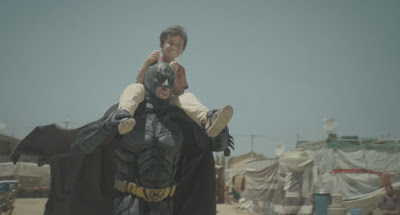 I am not the best equipped person in the world to judge the emotional impact this advert will have on people: I will get teary-eyed at the slightest provocation – and this had big wet ones rolling down my cheeks. It’s a visit to a Syrian refugee camp where a small boy gets a visit from his hero – Batman. Created by Bee on Set Productions for Warchild Holland, watch this to the end where, if you’re human, the ‘reveal’ will have you in bits. A tiger swallowtail butterfly springs from a buddleia (often known as the butterfly bush). Its beauty is simply breath-taking and it doesn’t end with the tiger. 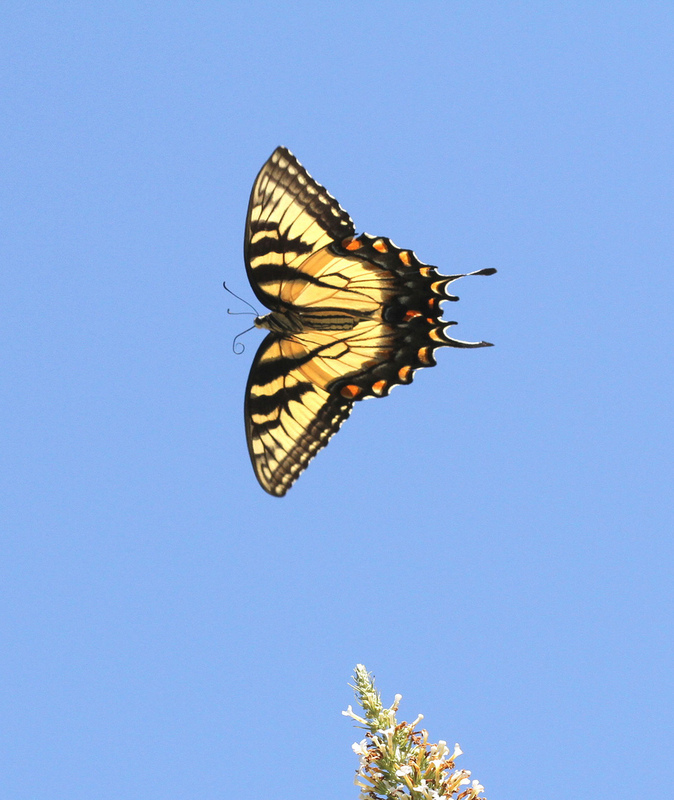 The swallowtail is a family that includes over 500 species. Our sibling site, the Ark in Space has a feature on ten of the most spectacular. If you are feeling a little jaded today then why not take a look – it may even restore your sense of wonder! Yesterday marked the one hundredth anniversary of the beginning of the Battle of the Somme, one of the most terrible battles of the First World War. 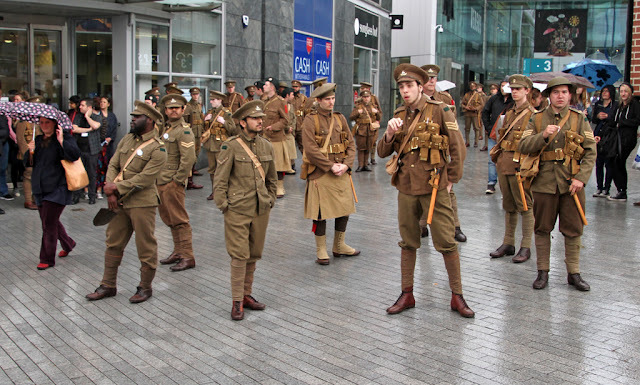 As the day dawned, towns and cities across the UK were witness to the return of a host of ‘ghost tommies’ as 1500 men suddenly appeared in full replica World War One uniform. Each man carried a card bearing the name of a soldier who died on the first day of the battle, together with information about his age and background. 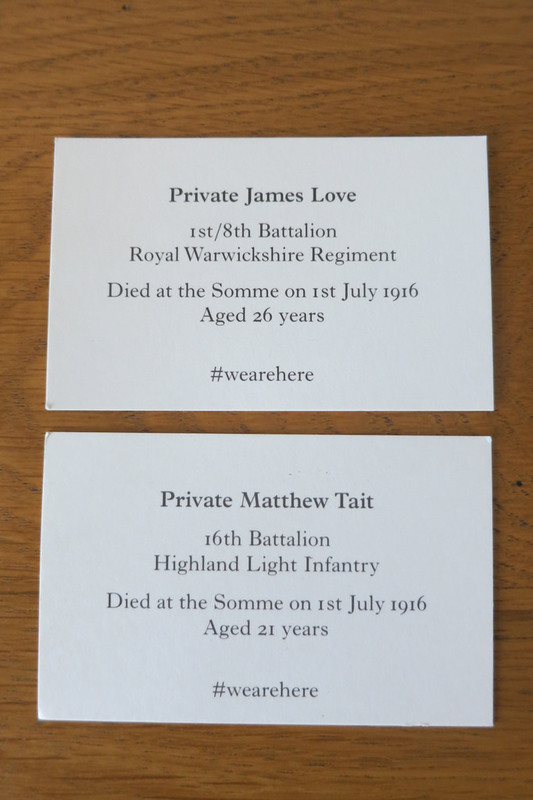 The volunteers were told to remain silent and simply give the card, bearing the information and #wearehere to those who passed by. Unsurprisingly, British social media was soon abuzz with pictures of the event. Silicon Beach is a name given to a part of the Greater Los Angeles area because of all the technology companies that are based there. This fantastic time-lapse was created by Timelax and takes in Santa Monica, Playa del Rey, Venice Beach and Marina del Rey – The biggest man-made harbor in the world with a capacity of more than 6,000 boats. If anything will give you a snapshot of the laid-back Californian lifestyle, then this is it! 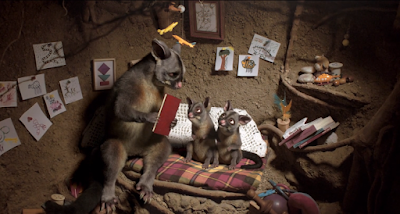 A father possum reads his kids a story that’s an alphabet of the most dangerous animal of all – HUMANS! Inspired by the Edward Gorey classic, this black-comedy for kids and parents alike is a hilarious and brutal alphabet of death and mayhem exacted upon animals by ignorant humans. 30 CGI animals were meticulously crafted and killed by a team of 44 students at Media Design School.